Whisper it, but the next mountain climb for Spurs at Wembley is against German giants Borussia Dortmund in the Champions League on September 13. That is hardly the test Tottenham need as they try to explode the myth that their temporary home is a hoodoo ground. It was not a jinx that struck yesterday when outplayed Burnley stole a point with their injury-time equaliser. There were no evil soccer spirits at work. The only thing to blame was Tottenham�s appalling finishing. They had 24 � yes, 24 � shots, but managed only four on target. It was like watching North Korean missiles misfiring. Our travelling guru Paul Smith gives his Wembley view of the match HERE, where you can read the catalogue of calamity. The report should carry a health warning. There were barrels of dung being tipped on the naked head of chairman Daniel Levy by his army of on-line critics as the disappointment of Burnley�s smash-and-grab equaliser sunk in. But it was not Danny boy who kept kicking the ball wide of the posts. Spurs were far superior to Burnley in every department, and spent so much time in their half they could have been prosecuted for trespassing. Mauricio Pochettino does not have it in his bones to shut up shop, which he should have done in the last minutes when you could sense a Burnley burglary was brewing. Let�s get things in perspective: Three Premier League matches played � a superb win at Newcastle, a defeat that should have been a victory against Chelsea, and then yesterday�s bombardment of Burnley, but firing blanks. By my reckoning Spurs should have nine points, and Harry Kane at least four goals. Don�t let�s worry ourselves into a crisis. Moaning and groaning about our luck � or lack of it � can be contagious, and spreads the poison of pessimism. All is fine. 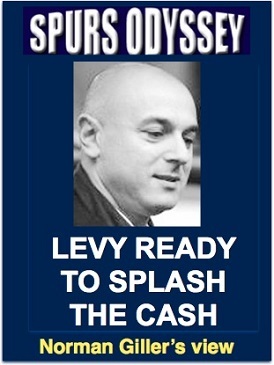 We just need to get our shots on target � and Levy needs to splash the cash. We have a very good squad. We need a great one if we are to compete with the two Manchesters, Chelsea and Liverpool. I will not mention what is happening to that team down the road in case it boomerangs on us. But it�s good to have something to cheer us up. I am confident there will be two, possibly three new signings before the window closes, and I hear that Ross Barkley remains on the radar despite Chelsea sticking their oar in. Now for the international break that comes at an irritating time. Then it�s back to face Everton at Goodison before the Borussia Dortmund examination � at �wunderbar� Wembley. WEEK 3 of the Sports Odyssey Quiz League 2017-18. The rules are simple: I ask one Tottenham-related question for which a right answer earns you two points, and then a related teaser that can bring you an extra point. There are more than 60 of you sharing top place after most of you got question No 2 right (Mousa Dembele, who scored in his Spurs debut against Norwich City). Which former Tottenham player is back at the Championship club with which he started his career, and which manager brought him to Spurs from his current club in 2005? That�s when I fall out with good friends. In the final count I am the sole judge, and you just have to accept that I am right. Arrogant, moi? Seriously, we are all in this just for fun, with the common bond of admiring all things Tottenham. Hope we all have a great season. First name drawn from the correct answers for SOQL week No 2 was Jim Logan, of South Croydon. who has followed Spurs since 1962. I will send Jim a screen version of my Spurs �67 book (you might consider buying a signed hardback copy from me at http://www.normangillerbooks.com � all profits to the Tottenham Tribute Trust to help our old heroes).